I wanted to share with you something that caught my attention (via Twitter). I think it is a great concept and wanted to spread the word. Also it would make an excellent stocking filler for all those fashion divas out there who don't have enough wardrobe space. So what am I talking about?....Loopyloops - go check out the website. This is a simple idea to create space in your wardrobe. 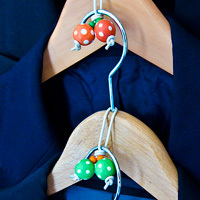 Loopyloops allow you to connect hangers together making use of the vertical space in your wardrobe. They are very attractive and come in a variety of designs and colours. Also they are inexpensive - £4.99 for a set of 10 (plus P&P). I admit I don't own this product myself but hope you can agree it was worth sharing. Since you don't have a Sephora we wanted to let you know that we are having a Sephora Giveaway right now and would love for you to enter. We are also having 3 more giveaways this month - all goodies from different lines at Sephora.